I discovered my passion for cycling in a very late age. I always enjoyed riding my bicycle starting from my boyhood: I rode for commute, I rode for enjoyment, I even raced a couple of times. But I started riding a road bike in my early 30s. Then I started watching cycling races, and immediately fell in love with. I watched some races including Tour de France 2008 edition, with little understanding what was going on actually. In the early stages, I was even thinking Mark Cavendish was going to win the Tour. Giro d’Italia 2010 stage 7, Vinokourov attacks. 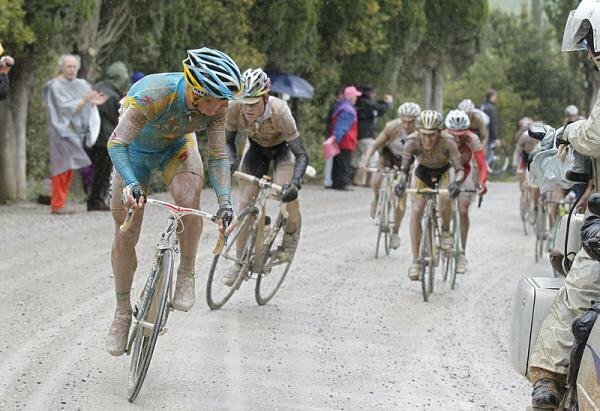 The hilly finale took in two 10km-long stretches of strade bianche, the ordinarily dusty white dirt roads made famous by the Montepaschi Eroica race. But I learn fast. During the 2009 Giro d’Italia, I was knowing what is what and I really enjoyed the race. Then I started waiting the Tour 2009 in a very excited mood: If Giro, the Tour’s little sister, was that beautiful, imagine how beautiful the Tour would be! But… during and after the tour, I was a bit disappointed. I didn’t see the endless attacks of Giro in the Tour. Riders seemed riding more conservatively to me. And from the starting point, it was almost obvious that Contador would win. Nobody really challenged him in three weeks, despite he lost some time due to missing a split in the peloton early in the race. 2010 was the same. The 2010 Giro d’Italia was great again (a lot of people were saying it was one of the greatest “Giri” in history, if not the greatest). And 2010 Tour? A soap opera between Contador and Schleck. Boring. Then I started to learn that a lot of people, including some pro cyclists and cycling historians were feeling the same way. “While working on our history of the Tour de France, I was struck by dearth of information available in English about the second most important race in the world, the Giro d’Italia. I say second most important, but I hope after reading this history the reader may come to hold the same opinion I have, that today it is the world’s finest race. The Giro ranks above all others not because it has a superior peloton or more fans or a longer history or greater prestige or more prize money. The Tour de France easily wins on all of those counts. But this is about sports, and sports are about competition, and there the Giro wins, hands down. First of all, the Giro takes place in Italy, blessed as almost no other place on Earth with beautiful cities, rugged mountains and people insanely passionate about sports. Here, bicycle racing matters, and matters a lot. The riders know they are competing under the hot light of fiery love of the sport. The Giro is raced in the spring, when sudden storms can come out of nowhere. In the mountains, this means abundant sunshine can quickly turn to intolerable cold, fog, rain, snow and ice. 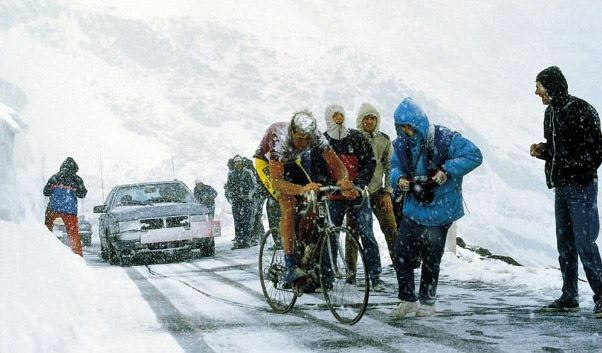 Some of the Giro’s greatest dramas took place while Mother Nature raged at the helpless cyclists. Only eight riders finished the 1914 Giro, a testimony to that edition’s difficulty. Other years have seen mass abandonments when the majority of the racers could no longer endure the dantesque conditions the race imposed. These episodes of terrible suffering, from which great champions have forged victories, are far more common in the Giro than in the Tour. Between baking Sicilian heat, near vertical Dolomite ascents, freezing snowstorms and blinding torrents of rain, the Giro has put its riders in extremis more often than the other Grand Tours. While it wasn’t always true, today the quality of the Giro’s racing is superior. I believe that the Tour de France’s racing is often dull and negative compared to that of the Giro. It may well be that the Tour is so important, the riders race it not to win, but to not lose. With its days of slow, piano racing mostly a thing of the past, the Giro can be a bare-knuckle brawl from start to finish. There has been no race in recent memory to rival the 2009 Giro, with its down-to-the-wire slugfest between winner Denis Menchov and Danilo Di Luca. The last time the Tour had such a fracas was probably the 1989 duel between Laurent Fignon and Greg LeMond. Today the Giro is measurably harder to race than the Tour. With power meters attached to the riders’ bikes, we know that Giro racers go deeper and expend more energy than those competing in the Tour. Following the footsteps of predecessor Vincenzo Torriani, current Giro boss Angelo Zomagnan creates race routes that are interesting, challenging to the riders, generally keeping the outcome in suspense until the final couple of days, leaving the sports fan excited and on the edge of his seat for three weeks. That’s why I love the Giro d’Italia. The great rivalry between Fausto Coppi and Gino Bartali is well known, mostly because of their adventures in the Tour de France. But for much of bike racing’s history the Alps have been a high wall, and Italian sponsors preferred to keep their racers at home where they could earn valuable publicity. Because of this, there is a whole world of great athletes who are virtually unknown to the non-Italian cycling fan. How about Giovanni Valetti? In 1939 Valetti beat Bartali when Gino was at the very peak of his powers. Has anyone heard of Giuseppe Enrici, the Giro winner who was born in Pittsburgh? Alfonsina Strada was the only woman who entered (and unofficially finished) a Grand Tour. And there was Giordano Cottur, who won a Giro stage in Trieste while guns blazed. “The Tour de France is a ‘bigger’ race than the Giro. It has more media, more commotion, more people making demands on the cyclist’ waning energy. What it doesn’t have is the tifosi. And another quote from a cycling blog, le-grimpeur: For me, France is a country of provincial banality, a land where patriotism flowers only to hide the bloodied earth of revolution, where history was begun at the Bastille by a horde of peasants running amok with pitchforks, decapitating their betters because they were just that. Before the Revolution, the French insist in their clipped accent, with a Gallic shrug of the shoulders meant to disarm contradiction, there was only poverty and aristocracy. Now…the shoulders shrug again and a jutting chin points to the dubious grandeur of France. The truth is they have now a poverty of spirit and an aristocracy of politicians. Italy is different. Italy is romance. – The actual quote from Signor Farfalla in “A Very Private Gentleman” by Martin Booth. Andy Hampsten, in the foreword of Maglia Rosa – Triumph and Tragedy at Giro d’Italia; Sykes, H.; Ruleur Limited; London, 2011. Why cycling is so great?